This is the live soundtrack from a martial arts exhibition, featuring Japanese koto, Australian didgeridoo, African drums, flute and synthesizer. Very melodic and meditative. It's one of our favorites and a best seller. Scroll down for more info. The CD is sold out, but downloads are available online. 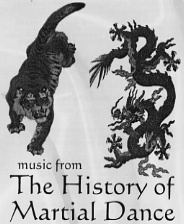 In January 1998, The Temple of the Full Autumn Moon presented "The History of Martial Dance," a theatrical exhibition of several styles of martial arts. Shannon Kawika Phelps, the sensei of the dojo, decided to have live musicians onstage accompanying the show. He was familiar with Didginus, and asked some of the members to put something together for the show. Randy Graves and Greg Callahan of Didginus joined with flutist Jon Agree and percussionist Mike LeBien to provide the music for the show, and this live recording is the result.